F1 drivers crashing during a demonstration run is more common than you’d think. Vettel has become the latest driver to add himself to a list of names which includes the likes of Max Verstappen, Kamui Kobayashi and of course, Pastor Maldonado. 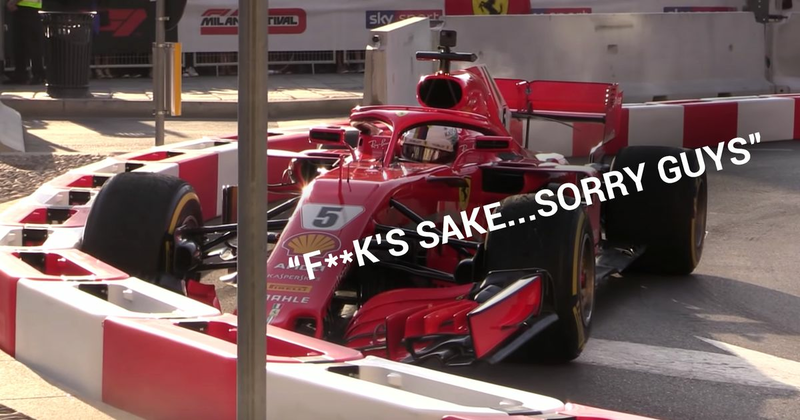 Vettel made a bit of an error whilst demoing the SF71H during the fan festival in Milan and lightly damaged the front wing. Given how narrow the road is, something like that happening seemed kind of inevitable. Of course, you don’t have to think back too far to remember the last time Vettel crashed into a wall, and someone has already overlaid his emotional team radio from his dramatic German GP exit onto this gentle bump, with amusing results.